Looking for some original mise en bouche filled with flavours? You are at the right place! 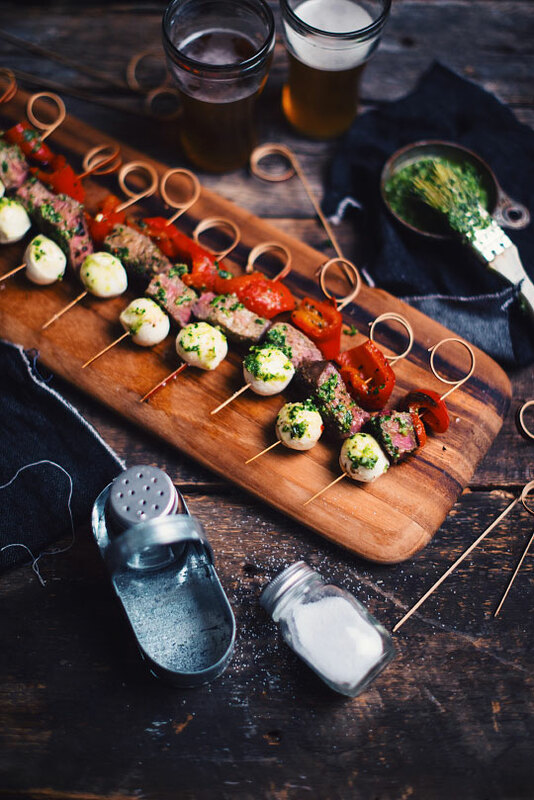 These mini-skewers with sirloin, grilled bell pepper and mozzarella takes longer to prepare but are guaranteed to be a crowd pleaser! Start by making the pesto. Put all the ingredients in a robot and blend until a smooth texture. Season with salt and pepper. Add 1-2 tablespoons olive oil and mix with a spoon. Set aside. Place the steaks in a big container and pour 1 cup pesto and 2-3 tablespoons olive oil on top. Season with salt and pepper and mix with your hands to coat well. Cover, place in fridge and let marinate for 3 hours. Remove meat 30 minutes before cooking to cool down. Place the bell peppers on a cooking tray, open side up, then add a small drizzle of olive oil. Sprinkle some Provence herbs on them (about 1/4 teaspoon by peppers), season with salt and pepper then rub to coat. Place in the oven and cook for 25-30 minutes. Flip halfway, open side down. Remove from oven and cut in slices then in two to form rectangular chunks. Set aside. In a big cast iron skillet heated at high heat, add a small drizzle of olive oil and wait for it to smoke lightly. Remove steaks from marinade and scrape excess with a spoon. If there is marinade left, if will form a crust in the skillet. Place the steaks in the hot skillet and cook for 3-4 minutes. Move meat from times to times. Flip and continue cooking for 2-3 minutes. At this point, steaks should be medium rare. Continue cooking until desired doneness if desired. Place in a plate, cover tightly with aluminium foil and let relax for 5 minutes. Remove fat from steaks. Cut meat in cubes and set aside. 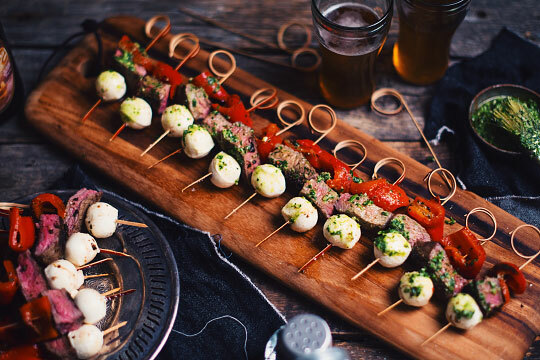 Using mini skewers, poke a chunk of pepper followed by a piece of meat and bocconcini cheese. Continue filling the skewers in that order then baste with fresh pesto. These bites can be eaten warm and you can keep them in the oven at very low temp. Dirk Niepoort is one of the most inspiring wine producer of Portugal! He brings up front local varieties that has hints of syrah with it's black olives and pepper aromas. Miam! I love sirloin, a cut slightly less tender than the tenderloin but more flavourful. Perfect for a barolo! A complex Italian red, profound and well structured, to decant one hour before serving! This rye beer, brewed with black and green pepper, offers notes of sweet butterscotch and powerful aromas of pepper. Is there anything better to go with meat, bocconcini, pepper and pesto? We don’t think so!